Miraculously, I managed to complete this week’s Life Book lesson before the weekend. 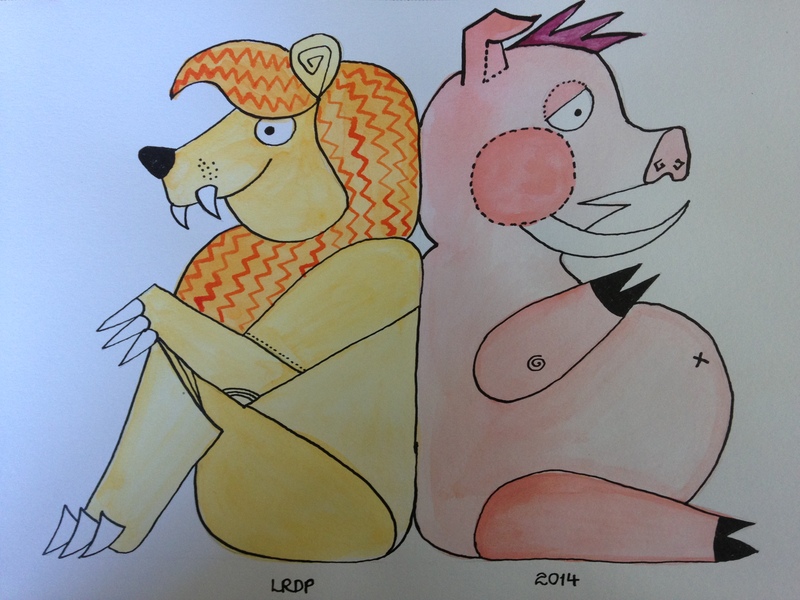 It was one of Tamara Laporte’s lessons on illustrations and whimsical characters, in this case an animal character. I had to improvise with the media used and opted for watercolour and collage. I went a bit too crazy with the background but I think I just about get away with it. My chosen animal was a pig simply because I really like pigs. It isn’t totemic, some sort of spirit animal, but just because I think pigs are smart and adorable. I added wings for an additional touch of whimsy. 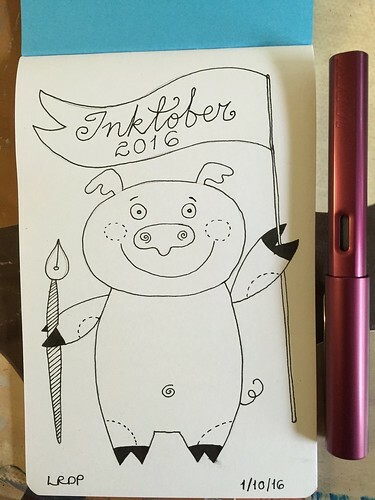 I have been meaning to participate in Inktober for the past couple of years. Time, my old nemesis, has somehow always undermined my plans. This year, however, I decided that I was never going to have any more time. Indeed, my free time is shrinking. Instead of waiting for some magical timeturner that enables me to have more than 24 hours in every day, I decided to just jump in and try my best to whip off one ink drawing every day of October. I probably won’t use the official Inktober prompts much. I may not manage to blog about my ink drawing every day. I am, however, committing to getting some kind of ink drawing onto paper every single day. To make things a bit easier and more flexible for me, I am going to produce each drawing using a fountain pen. If I find time, I may add some other inks using my dip pen or a brush but the basic line drawing will be done with a fountain pen. Since today, 1 October, happens to be a Saturday, I was able to get a drawing done this morning. It took me just a few short minutes which is encouraging as I should be able to find ten minutes in each day to just sit and draw. The challenge now feels more do-able having produced the first drawing. Anyway, I thought this drawing was apt for the first page in my notebook for the first day of the challenge. This week’s Colour Me Positive theme was Intuition. Listening to your thoughts and feelings, heeding that little voice in the back of your mind, that insistent bubble in the gut, and following your instincts is something I am pretty big on. Translating that visually onto a page, however, was going to be really tough. I thought about focusing in on the word “trust” but instead it was the word “gut” that kept pinging back into my mind. So I went with my gut and decided to make my art journal page revolve around guts. I treated myself to a bunch of Dylusions paints and was eager to get stuck into playing with those. 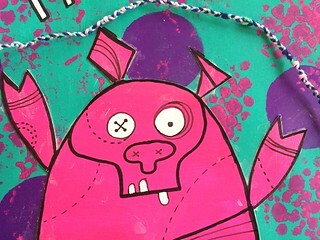 I thought their bold, vivid colours would lend themselves to my zombie illustrations. 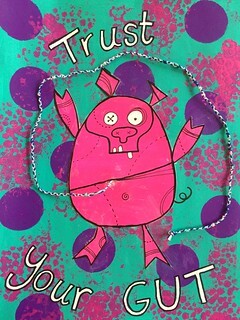 Normally I would default to my favourite zombie bunnies but I decided to totally ignore my gut instinct, rebel against it, and depict a zombie pig instead. I used embroidery floss to create the string of guts. Pleating that was a bit of a pain. I had flashbacks to trying to learn macrame when I was 8. I was initially planning to glue the guts down but decided to leave them floppy and loose and flexible. More gut-like. As per usual, my stencilling bites but in zombie art work that doesn’t really matter now, does it? I really like how thick these paints are and how richly vibrant the colours are. I think I am going to have a lot of fun experimenting with them. This week’s Life Book lesson was all about “happy painting”. The lesson was taken by Juliette Crane and the object was to use layering, loose mark-making and different tools – including fingers – to apply paint in order to create a piece depicting a whimsical owl or creature of our choice. I have always had problems working in a very loose style. I think I tend to be too “illustratory” about my art work. Ultimately it is probably symptomatic of me being a control freak. I did, however, have fun applying and spreading paint with my fingers. I also used a lot of dripping, splattering and spraying in order to have less control. It was a really enjoyable lesson and definitely fulfilled the brief of being “happy” painting. 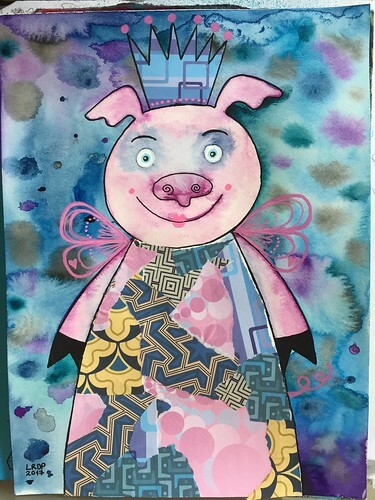 I decided to choose a pig as my whimsical creature. My first thought was to paint a rabbit because I seem to have rabbits on my creative brain, always hopping around, but I also wanted to resist that impulse. 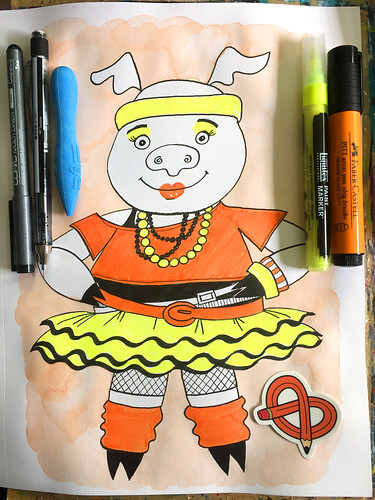 I have always liked pigs so a pig it was. 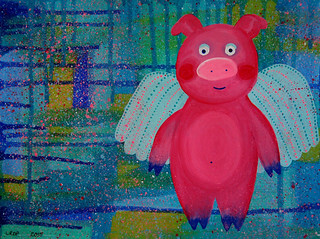 And to ensure it was whimsical I decided it should be a flying pig. I actually have two pottery flying pigs that need to be hung on my wall. I have had one of them since my teens, when I bought it at a craft fair, and then I found another at a completely different fair just a few years ago. I should have bought a third. I cannot imagine I will have the opportunity to buy a third now given I am not on the same continent. I must, however, get those pigs up on the wall. But I digress…. I always used to tell people that I could draw but could not paint to save myself. I am competent with watercolour but I usually treat it more like ink, using it as a drawing tool rather than in a painterly way. Working in acrylic and oil paints always defeated me. A few years ago, the art club I was secretary of organised a weekend course that was about painting nudes. I enjoyed life drawing so signed up for the course. The tutor explained that we would be working in acrylic. I asked if I could have special dispensation to work in ink. I am very comfortable working in ink. No. The point of the course was to paint so I was to paint. I was to step outside my comfort zone and paint. Besides which, he assured me, anyone who could draw as well as I could draw would be capable of painting. The following day, at the course’s conclusion, the tutor looked at my painting, sighed and said, “You weren’t kidding”. 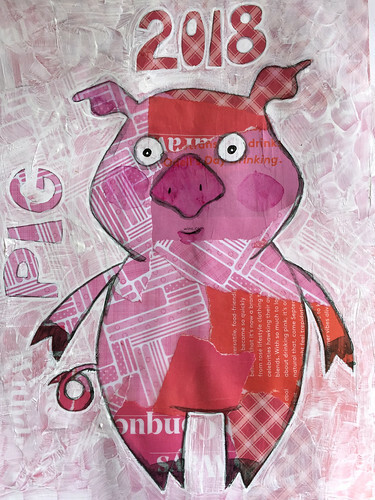 So one of the challenges for me, in experimenting with mixed media and especially upon embarking on the Life Book course, has been to develop my painting skills and simultaneously, maybe even consequently, improve my confidence with painting. As you can see from this effort, I am not quite there yet. I am, however, improving. Little by little I am experiencing small moments of success – even if with just an element of the painting – and little by little my skills are improving. Maybe by the end of this year I will stop adding “but I can’t paint” to that statement. Maybe. The Nemean Lion and his colleague the Erymanthian Boar were both ferocious monsters. The Nemean Lion – yet another child of Typhon and Echidna – had golden fur that was invincible to attack and claws so sharp they could tear through armour while the Erymanthian Boar was simply vicious and wild with no super-powers. Both were ultimately defeated by Heracles as part of his Twelve Labours. The destruction of the Nemean Lion was indeed his first task. Heracles trapped the beast in its cave and then clubbed and strangled it to death, having discovered that no weapons could pierce its hide. He then used one of the lion’s own claws to flay it and he then wore the lion skin about himself for protection. The capture of the Erymanthian Boar was Heracles’ fourth labour. On the advice of Chiron the Centaur, Heracles drove the Boar into deep snow to give himself an advantage and then wrestled it. I decided to draw the monsters waiting around for Heracles to show up. Thinking of the Aesop’s Fable of the Tortoise and the Hare, I imagined them being rather complacent, anticipating easy victory, not preparing at all, as they assumed they would easily defeat their foe. I drew them sitting back to back, trading stories of humans they had ripped to shreds. They both look rather goofy and the Erymanthian Boar would probably benefit from going on a diet.